Received a call yesterday around 6:30 pm from the Summit County Sherriff's department. Guess what? Rachael was in a car accident. It was a minor, rear end accident with no injuries but she has no collision coverage and you know what happens to premium when you report an at fault accident? Oh well, at least she was not injured and hopefully she learned a lesson. She will have to go to court as in the state of OH a minor must go to court if involved in an accident or receives a citation. 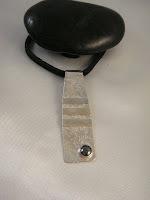 I was very happy this week when a customer wanted me to create a pendant and left it up to me to design it. The only characteristic she wanted was that it was to be a longer pendant. She was so happy the way it turned out. What a great feeling it was to see how happy she was with her new piece. I have attached a picture of it. I am, of course, naming it after the customer and friend - DARCY! Weather is a bit dreary today which is good because then I do not feel guilty working in my studio and staying inside to clean. I am glad she wasn't injured! I am sure it was a scary call for you to receive!